If you want to get people to collaborate more, stop emphasizing virtual meetings and find ways to get them together in physical ways. That's what Massachusetts Institute of Technology found in a recent study among its researcher population. The project analyzed 40,358 published papers and 2,350 patents that grew out of MIT research and published or patented between the years 2004 and 2014. The researchers developed a network map of MIT collaborators and discovered the influence of spatial relations on campus that went above and beyond departmental and institutional structures. Cross-disciplinary and interdepartmental initiatives were especially spurred by face-to-face interactions within shared spaces. "If you work near someone, you're more likely to have substantive conversations more frequently," said Matthew Claudel, lead author of a paper that shared the findings and a doctoral student in MIT's Department of Urban Studies and Planning and the MIT Lab for Innovation Science and Policy. In other words, he noted, there's a tie "between space and collaboration." Researchers have "a better chance of meeting someone, connecting and working together if you are close by spatially." While the results may seem intuitive, Claudel added, the data also confirmed the "Allen Curve." Thomas Allen, a professor emeritus at the MIT Sloan School of Management who has long studied workspace, described in his 1977 book, Managing the Flow of Technology, how collaboration and interaction shrink as a function of distance, producing a curve when plotted out. These two graphs show the relative frequency of collaboration among MIT faculty as plotted against their daily physical distances on campus. Plot A covers papers; plot B covers patents. As the distance increases, the likelihood of collaboration decreases. Source: "An exploration of collaborative scientific production at MIT through spatial organization and institutional affiliation"
In the case of the recent research, the authors identified a similar curve, this one expanded to encompass a complete campus rather than individual floors or buildings and focused specifically on interdisciplinary research. 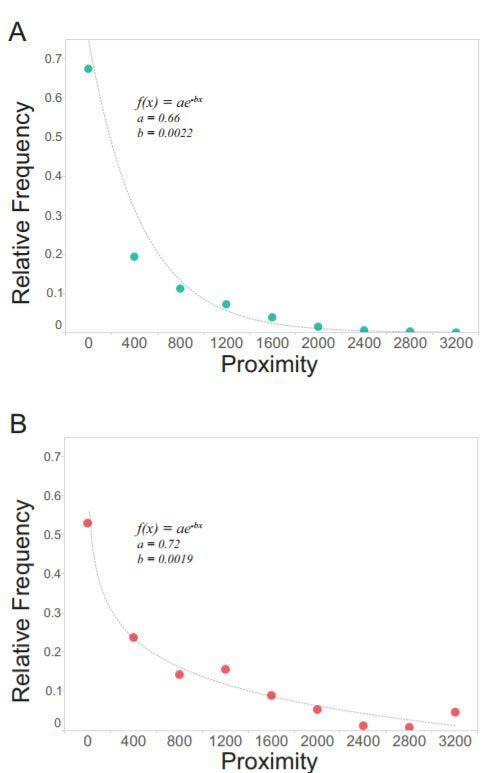 Interestingly, the effect of proximity on collaboration varies for papers and patents. When it comes to co-authoring papers, people who work in the same space were more than three times as likely to collaborate compared to those who were 400 meters apart. That frequency of collaboration was halved when researchers were twice as far apart. For patents, the curve wasn't quite so steep. Individuals in the same workspace were more than twice as likely to collaborate compared to those who were 400 meters apart. That likelihood was halved only when the researchers were 1,600 meters apart. Claudel suggested that what seems more defining for patent teams is physical space, while "departmental affiliation seems to be more defining for paper-publishing." But in both cases, he and his team found "a persistent relationship between physical proximity and intensity of collaboration." The paper, "An exploration of collaborative scientific production at MIT through spatial organization and institutional affiliation," appeared in PLOS ONE, an open access journal that accepts research across disciplines in science and medicine.